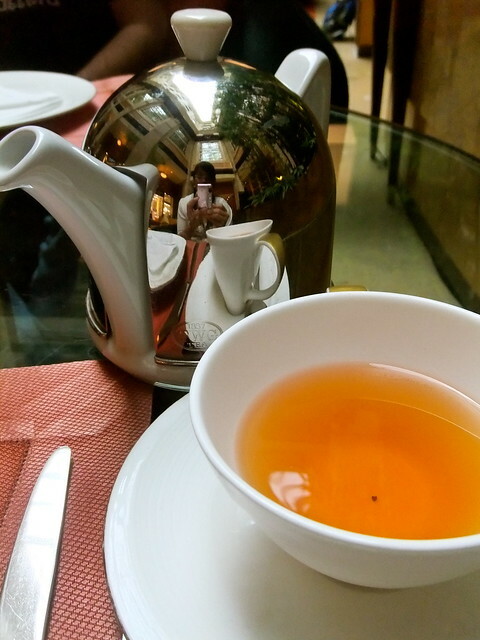 I have never heard of such a concept as High Tea or Afternoon High Tea before I went to Singapore. Apparently, it is huge here and probably in each and every country the Brits occupied as it’s an English institution dating back to the early Victorian Days. It makes sense because if Spaniards were into siestas and afternoon rests which the Filipinos were more than willing to adapt, then this is their thing. Interesting to think that while the colonizers are resting or having a midday tea break, the rest of the colony are outside, under the sun, doing the backbreaking labor. Traditionally, High Tea offers ‘something hot, something savoury and something sweet’ which is what The Courtyard at The Fullerton offers in their Afternoon Tea menu. G made a reservation for us to go to The Courtyard at the Fullerton Hotel for his pre-birthday celebration. 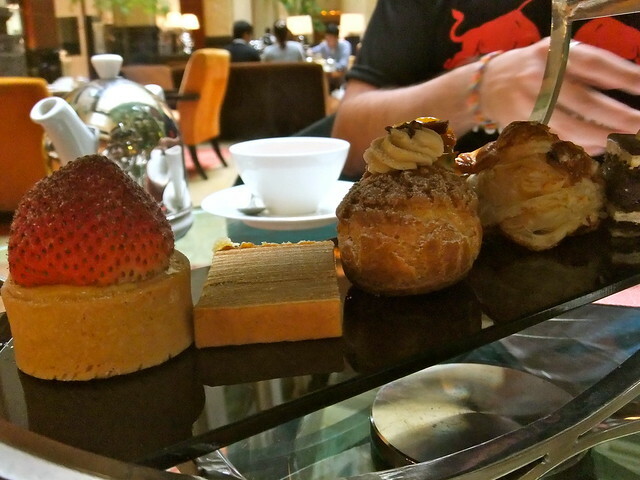 It wasn’t my first High Tea as we had one at Halia Restaurant last year but this time, it’s a bit more upscale. G asked me if I was a fan of High Teas but I can’t really say because this was only my second. But come to think of it, who wouldn’t want Afternoon High Tea if you were served with pretty desserts and yummy savoury treats! And unlimited too so you can replenish your plate with you favourites. First off is choosing your drinks. They have a huge tea selection (from TWG) for you to choose from. You can only order two different types of tea all throughout and is served one at a time. You may also choose to have coffee which is ‘unlimited’ AND a single choice of tea. Also served one at a time. For me I had a vanilla-infused black tea for starters and a latte at the end of my meal and G ordered a HAPPY BIRTHDAY tea (yes! it’s the name of the tea) which is a fruity-type of black tea. I really don’t have a sweet tooth so I am more excited to taste their savouries. Here are most of them ranked according to my preference. Caviar and Tuna (or Salmon I’m not so sure) in a cone. 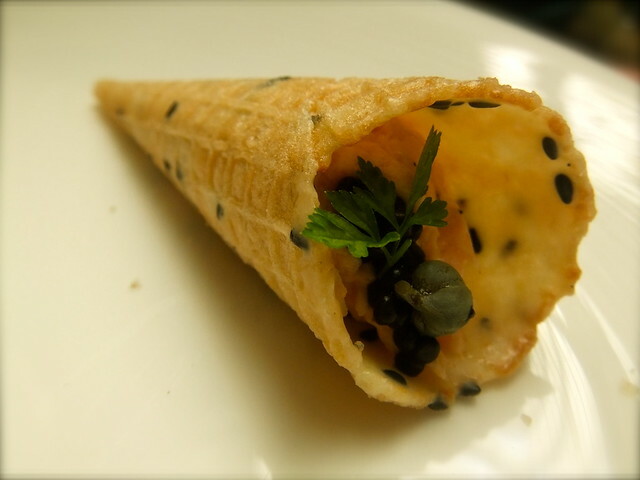 The saltiness of the fish flakes and the caviar infuses well with the hint of sweetness of the cone. I had several helpings of this fella. 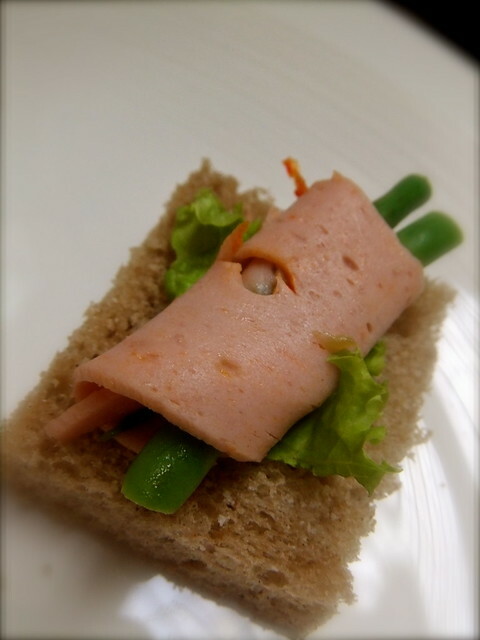 I have always loved the combination of asparagus-ham. I guess it would have been better if it was asparagus wrapped in bacon. Hmmm… This is their version of Asparagus Beef. 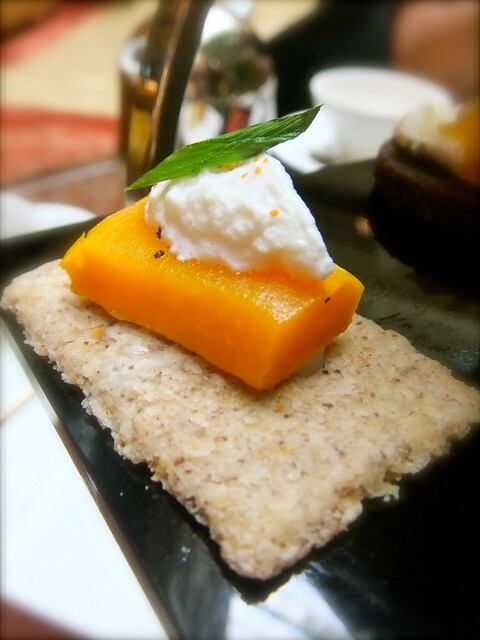 Their ‘Singaporean’ take of a savoury dish is in this tiny treat. 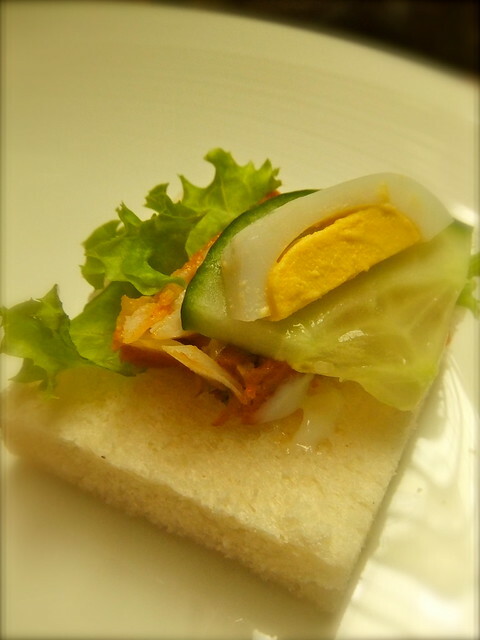 Otah on white bread topped with cucumber and a slice of (quail probably because it’s just too small to be the regular one) egg. 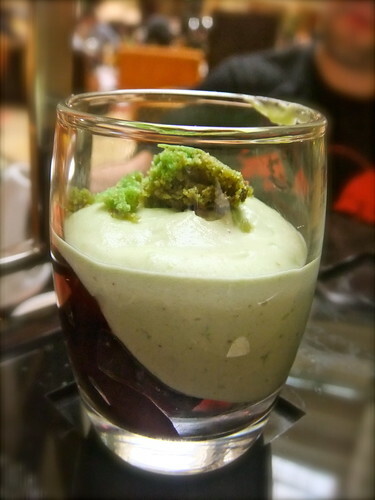 The Otah is flavourful enough to be served by itself without any fancy dressing. 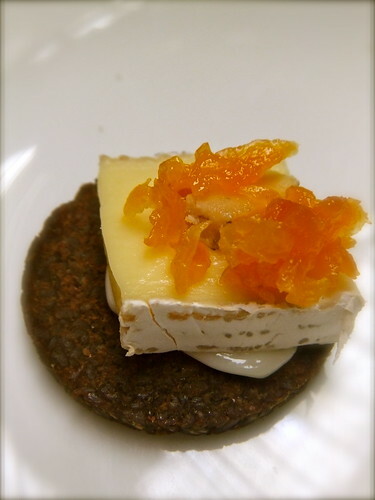 Pumpkin Crackers. A slice of a Scandi-type (I think this is some kind of a knackerbrod or something) of bread garnished with pumpkin and a dressing. Delish! Scones with jam and cream were also served during the meal. They have really good scones, moist and fresh. Careful with eating too much though, you might not have room for your sandwiches and desserts. 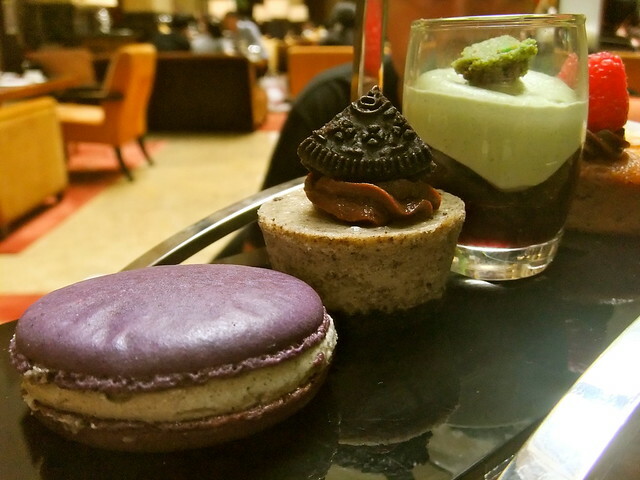 First photo (L-R): Macarons with an oreo cream cheese filling of which I’m not a fan, Oreo Cheesecake, Green Mint Thingy. 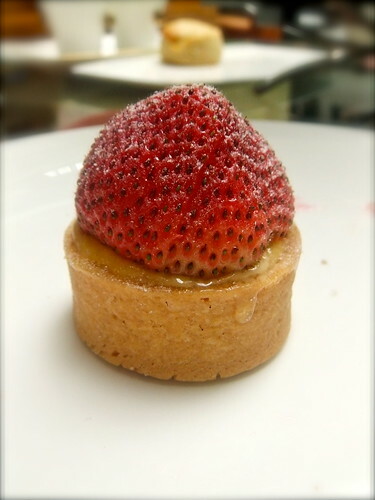 Second Photo (Left-Right): Strawberry Lemon Tart, Kueh Lapis (yes, I’m a fan! ), Cream Puff, Apple Pastry Tart, Coffee and Choco Mousse Cake. I don’t really go gaga over strawberries but this one is good. It has a lemon cream underneath it. The combination of sour taste from the berry and lemon matches well. 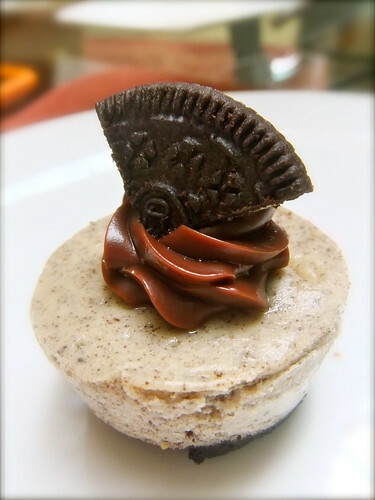 Just your regular Oreo Cheescake only mini and much prettier. A bit too sweet for me but I guess it tastes just fine. Cream Puffs! 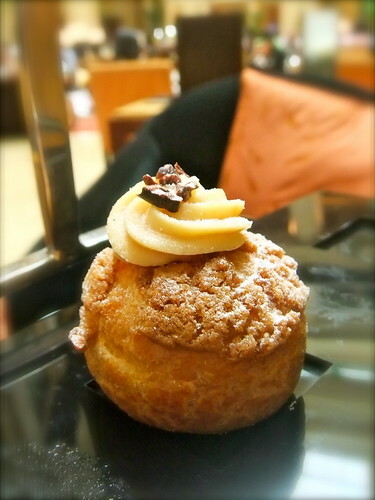 I love cream puffs! And I love this little guy. I had two servings of this. Yum! 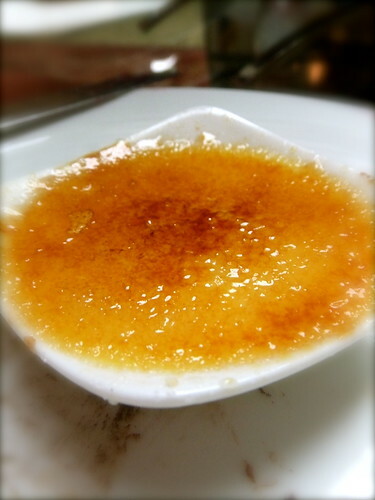 Aaaah… Creme brulee. based on its looks, I pointed this out as one of my top 3 sweets and it didn’t fail. I just love Creme Brulee and the flan in it. Never mind how sweet it is, it still is love. Lime and mint and definitely doesn’t have a chocolate base. It is something else I do not know of. Not one of my faves but G’s. Included this in my top 3 based on looks because I simply love apple tarts. It failed miserable though. 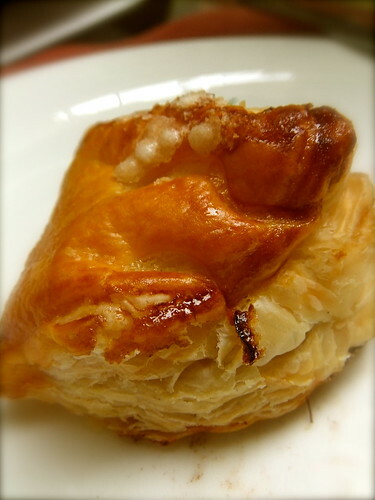 It’s too flaky and there’s not much apple filling. And here’s G’s cake. I think I requested from the staff twice for this ‘cake’ and they only sent it over to our table after we’ve paid and when I started giving them ‘the look’. What’s with the delay? 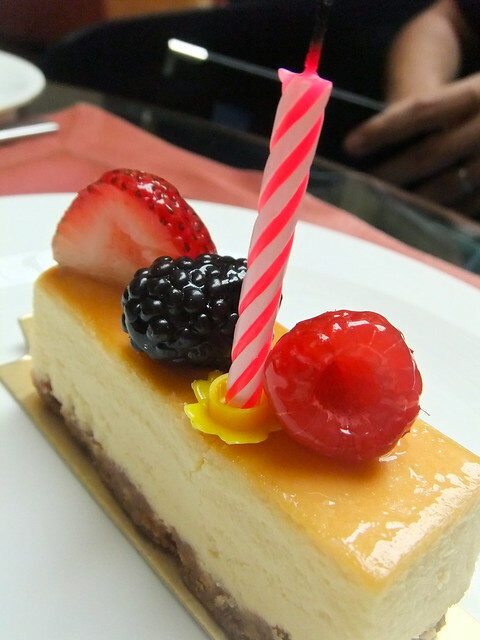 Anyway, It’s just your regular cheesecake with fruits on top. What makes it special is that it’s a ‘birthday cake’ with a candle and when it’s lighted, G had a chance to make a wish before blowing the light out. It may seem too much to spend on these little pastries and sandwiches but after you’ve had one, you can really say it’s worth the food and experience. I guess it would have been better if it was buffet so you won’t have to wait for the servers to pass by with their tray-full of goodies. But with what I had, I don’t think I have the right to complain. I suffered alot over the years here in Singapore. It is a strange place. There is British colonisation i.e. a heritage of the way the British used to live, while at the same time there are the Chinese temples and Muslim hawkers and Indian moneychangers basically it got so confusing that lately when I was troubled over “Chinese wedding customs” versus “ROM marrital registration” my younger sister decided she could barely wait and went ahead of me. By now my romantic engagement is as if non-existent once again, it so happened that I recall myself being engaged awhile ago before my sister married.